One of the most thrilling attractions at Walt Disney World is Lights, Motors, Action. 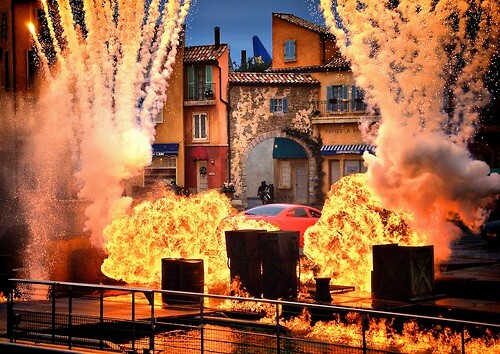 This amazing cars stunt show at Disney’s Hollywood Studios is a definite must see when visiting the movie themed park. The show originally debuted at Disneyland Paris and was such a hit they brought it to Walt Disney World in Florida and it opened on May 5th 2005. All members of the family are likely to enjoy this spectacular show. It lasts for 33 minutes and features car stunts, an exciting car chase sequence and plenty of explosions and thrilling stunts to keep the audience wondering just what is about to happen next. The opening sequence is my favorite part of the show. It it a fast moving car chase showing just how amazingly skilled the professional stunt drivers are. There is a cast of more than 50 stunt performers for Lights Motors Action. The stadium for Lights Motors Action is huge. It seats 5,000 people but don’t let that fool you into thinking there will be ample space and you can arrive late! At busy times it reaches capacity. The design of the stadium is excellent and most seats have a good view of the action. Not so great is the design of the seats which are solid metal benches. Not too comfortable for a long period of time. But mostly you will be too distracted by the action to mind! One thing to bear in mind is that it is pretty difficult to leave the stadium in the middle of the show. So learn by my mistakes and make sure the kids go to the bathroom before the start of the show! At slower times arrive around 15 minutes before the show opens. It takes quite a while to get into the stadium and take your seat. At very busy times arrive at least 30 minutes early.